Many people have fond memories of eating strawberries as children on the knees of their grandparents or sneaking a few berries as they filled their baskets from the local pick-your-own strawberry farm. Back during the “good ol’ days” the primary way people enjoyed strawberries was by picking them from their own gardens, picking them from a local farm, or buying them from a local farmer who either picked or had his help pick them for market. Each month I have people write and ask how to find the “old” varieties of strawberries that their grandparents grew. They testify that the new varieties just don’t seem to match their memories of the strawberries they so enjoyed during those bygone days. The explosive strawberry flavor they remember just can’t be matched by the modern strawberries they buy off the shelf; and, they can’t even get the same flavor by growing their own strawberries from the commercially available varieties available online or at local nurseries. Fairfax Strawberry Plants Are Back! 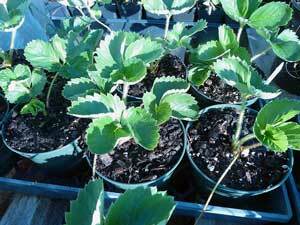 I’ve had countless requests for information on and requests for buying Fairfax strawberry plants throughout the years. People in their 60s and 70s who remember the Fairfax strawberries they consumed in years past ask for them by name regularly. Many more ask about old varieties that they loved, but can’t remember their names. Fairfax is probably one of those varieties they are missing. Fairfax strawberries are a specific heirloom hybrid strawberry. They were selectively bred by the renowned strawberry breeder Dr. George M. Darrow in 1923, selected in 1925, and released in 1933. Shortly thereafter, they became quite popular due to the excellent flavor profile they possess and found their way into the maws of many hungry children and adults (thus forming those memories aforementioned!). Their success led them to be used in further breeding programs, and their genetic composition has contributed parentage to numerous later strawberry varieties, many of which are readily available today, the most notable of which are as follows: Ozark Beauty, Surecrop, and Ogallala. Although the parentage of Fairfax strawberry plants themselves is uncertain, Dr. Darrow believed Fairfax parentage was probably Etters 450 x Howard 17 (Pre-mier) or Howard Supreme x Etters 450. There were a few problems with the Fairfax strawberry variety, however, at least as far as commercial strawberry farming goes. While Fairfax strawberry plants produce berries that are arguably the best-tasting of all the Fragaria x ananassa hybrids, great taste isn’t the only thing that matters when it comes to profiting from the sale of large-scale production of strawberries. 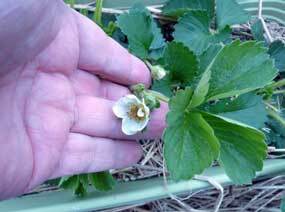 Durability of the Fairfax strawberry plants and their strawberries posed some problems. Fairfax strawberry plants are not as fully disease resistant as some of the modern cultivars are. If you are a farmer planting acres upon acres of strawberries, reducing the risk of infection by pathogenic fungus or other opportunistic entity is a must. While this concern is much smaller for gardeners and enthusiasts, the Big Boys drive development of new strawberry breeds, and everyone else usually adopts the varieties they do over time. With today’s global market and coast-to-coast shipping within the United States, most people no longer pick produce and eat it the same day. Agricultural experts grow the produce, process it, pack it, ship it to the stores. Then, store personnel receive it, stock it, and finally sell it to you and me. We take it home, refrigerate it, and then finally use it. That is a whole lot of moving and shaking! Fairfax strawberries themselves have a softer and delicious texture, but this makes them more prone to bruising and damage during the picking/packing/shipping steps. Berries that don’t ship well don’t sell well at grocery stores. So, with the changing demands of commerce, Fairfax strawberry plants fell out of favor with growers in favor of more robust, but often less flavorful, cultivars. As newer, more robust, higher volume varieties gained more and more traction, the “noble grandfather” Fairfax strawberry plants were phased out of commercial production and eventually died off or were replaced with the latest highly-touted varieties that emerged from breeding programs around the country. As stock dwindled, so did availability. Eventually, the Fairfax strawberries essentially disappeared. A supply of Fairfax strawberry plants couldn’t even be found through the internet. All that existed were hints, myths, and anecdotes of the legendary flavor contained within the scion of Fairfax…until now, that is. The most notable attribute of Fairfax strawberries is their unrivaled taste. It is eminently flavorful. Cool, cloudy weather and hot, windy weather can diminish its flavor slightly, however. The flowers of Fairfax strawberry plants produce a very large amount of pollen, which might partially explain its flavor. The variety is resistant to leaf spot and other leaf diseases, but is susceptible to red stele root disease and virus infections. The berries are very low acid which makes the less suitable for freezing, but their fresh eating and dessert quality is unsurpassed. Fairfax strawberry plants produce a moderate amount of good-sized, deep red strawberries. Fairfax strawberries turn purplish when overripe. As mentioned above, Mr. Wellik has served the heirloom enthusiast community well by laboring to bring Fairfax strawberry plants back to the marketplace. It wasn’t easy, and the journey is into its 5th year as of this writing in the latter half of 2015. Mr. Wellik located a pure source of Fairfax strawberry plants at the USDA Agricultural Research Station in Corvallis, Oregon, where they maintain the National Clonal Germplasm Repository over 4 years ago. He then requested material from the USDA-ARS, and about a year later received two unrooted runner plants in late September. Due to the state of the plants, they had to be rooted and then kept indoors all winter. The following spring, they were found to be infected by a virus and had to be destroyed. Later that year, another individual was directed to the USDA-ARS by Mr. Wellik and likewise obtained Fairfax strawberry plants from them. They survived, reproduced, and Mr. Wellik obtained four rooted runners from this sample this past spring. From that initial handful of plants, he has applied his extensive knowledge of strawberry reproduction and care and now has hundreds of rooted Fairfax strawberry plants. And, fortunately for everyone, they will be available for sale soon! To sign up for the waiting list, be sure to visit Mr. Wellik’s page and put your name on the list. The plants will be more expensive initially due to the very limited number and the length of time and expense involved with the development. But, Fairfax strawberries are at the top of the list for the best-tasting hybrid fruit in existence. The flavor is exceptional, the stuff of legends. It is an ideal choice for home gardens and pick-your-own operations, but likely won’t be able to carve out a niche for itself in the large-scale, commercial market for the factors already discussed above. Fairfax strawberry plants produce a moderate number of strawberries and a moderate number of runners. For the first time in many years, Fairfax strawberry plants will be available again in the fall of 2015 or the spring of 2016. Be sure to keep abreast of the latest developments and/or sign up for the waiting list by visiting Mr. Wellik’s page dedicated to providing access to Fairfax strawberry plants here. Does anyone know what zones Fairfax do well in? I am not a commercial grower, just interested in plants for my garden. I am in Zone 8B. Fairfax should grow adequately in your zone. The major problem will be pathogenic infection. If you can keep the fungus as bay, you can do well. Good luck! Great! They used to be one of the most popular varieties! a very dark coloured type close to brown. Unfortunately, I am not familiar with that variety! Sorry! I would like purchasing information on the Fairfax. Availability and price? As of now, they are only available commercially through Mr. Wellik at the link above. Clicking that link will take you to his page where information about availability and cost can be pursued. Good luck!